Monkey Shoulder Scotch Whisky is a popular Whisky available from 31dover.com in 70cl to buy online. Visit 31dover.com for the best price for 70cl of Monkey Shoulder Scotch Whisky or compare prices on our other Whisky products. With an elegant, stylish nose of marmalade, Crema Catalana, cocoa and malt giving a palate that is very malty, creamy delivery which offering up redolent of berry fruit, juicy toasted barley, cloves and butterscotch. The finish is of medium length, with clove-studded oranges, creamy vanilla and peppermint on the tail. Where to buy Monkey Shoulder Scotch Whisky ? Monkey Shoulder Scotch Whisky Supermarkets & Stockists. 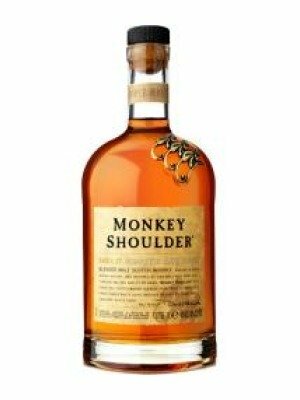 You can buy Monkey Shoulder Scotch Whisky online in most retailers and find it in the Whisky aisle in supermarkets but we found the best deals online for Monkey Shoulder Scotch Whisky in 31dover.com, Tesco Groceries, Waitrose Cellar, TheDrinkShop, and others. Compare the current price of Monkey Shoulder Scotch Whisky in 70cl size in the table of offers below. Simply click on the button to order Monkey Shoulder Scotch Whisky online now.